If you were here, I'd tell you I'm sorry. 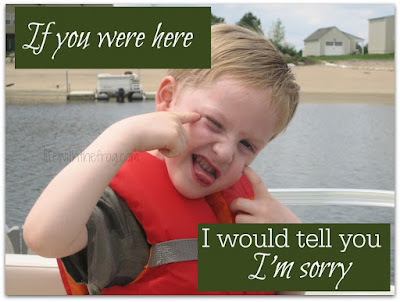 I'd tell you again how sorry I am that I slapped you in Target's parking lot. or invite your preschool friends to your fourth birthday party. I'd tell you I'm sorry that the tooth fairy never visited you. I'd tell you I'm so very sorry that I didn't believe you when you said you were having headaches. I'd tell you that yes, in fact, it is possible to have a headache every day. I'd tell you I'm sorry that I never talked to you about death or Heaven. I'm sorry we never said prayers at night. I'd tell you I'm sorry for a million other missed opportunities and first time parent flubs and for the fifty percent of the things that are inevitable in life that you had to learn about way too soon. But you're not here, so I can't say I'm sorry for those things. I can tell you that I'm sorry there was one monster that I couldn't protect you from. I'm sorry that your grave on the hill is lonely because we hardly ever visit. I'm sorry that your brothers are growing up without you. I'm sorry that our house has turned angry and sad and mopey and sometimes joyless. I'm sorry there is someone who lives with us now whom you never had the chance to know. I'm sorry that your family is not running races in your honor or starting foundations or writing books about you. I'm sorry I haven't learned to live as vibrantly as you did. And I'm especially sorry that I still haven't grasped that sometimes it is too late to say you're sorry . . .
. . . or 'I love you' . . .
. . . or 'let's try again' . . .
. . . or 'I'm listening' . . .
. . . or 'I appreciate you' . . . If you were here, I'd ask you to help me remember those things. Remind me with your smile, your quickness to forgive, your willingness to accept. If you were here, maybe I wouldn't even realize that I have anything to be sorry about. But that's the irony of losing you. Your absence makes me realize that I do have things to be sorry about. And things I need to learn.